EDC’s economic snapshot shows that San Diego’s economy is gaining steam. From April 2013 to July 2013, the San Diego region added 13,000 private sector jobs. 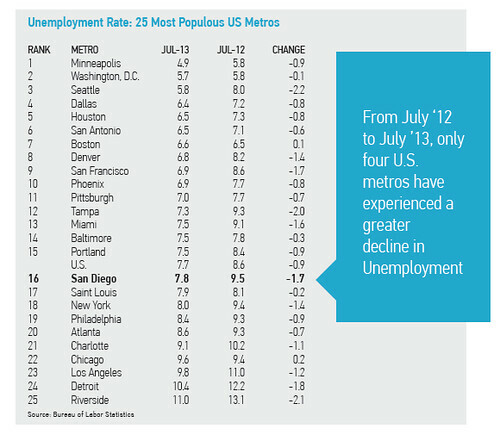 Although the metro’s unemployment rate still stands slightly above the national average, San Diego experienced one of the largest year-over-year declines in the U.S. from July 2012 to July 2013. Only four major U.S. metros – Seattle, Tampa, Detroit and Riverside - experienced a greater decline over that period. Private businesses added approximately 13,000 jobs in the quarter. Hospitality and tourism added the highest number of jobs this quarter, with 7,600. Construction industry added 4,100 jobs in the quarter, which is likely due to many major construction projects ramping up in the summer season. With the recently-approved expansion of the San Diego Convention Center (not included in these numbers), the region will add nearly 7,000 hospitality and tourism jobs and 3,000 construction jobs in a future quarter. This quarter, the snapshot took a closer look at the Sports and Active Lifestyle industry, based on a report that was recently released. With companies including Taylormade, Sector 9 and other well-known products, San Diego is a designated leader in this important sector. The report found that the industry’s economic impact is equivalent to hosting four Super Bowls annually. All major metros nationwide experienced positive growth in home prices over the quarter and the year, a symptom of the resurging US real estate market. From Q1 2013 to Q22013, home prices grew about 13.7 percent in the San Diego region. The quarterly snapshot reports on key economic metrics that are important to understanding the regional economy and San Diego's standing relative to other major metropolitan areas in the U.S. The snapshot only reported on data through Q2 2013. Amidst the current government shutdown, we can only hope that there’s data next quarter to produce a new snapshot. You can find the complete snapshot here.